The group I chose to study and research dealt with the simulation of soft geometries, including tensile structures, and the fabrication of such models. I chose this group study mainly because I felt it was rather valuable to my colleagues and I in terms of the projects we’ve been designing in studio and the nature that architectural modeling and what it’s becoming. We started out researching the types of programs available that were capable of these abilities and found that the three main programs were Rhinoceros, Maya, and 3d Studio Max. Each of these high-powered programs has a slew of add-ons and plug-ins with many different special tasks to aid in the three-dimensional modeling process. As a group, we chose to further research Rhino and its capabilities because it has a certain plug-in that we were interested in, that plug-in being Grasshopper. Grasshopper is a plug-in for the modeling program Rhino that allows for better and more detailed parametric design within the Rhino itself. Although Rhino is considered a “converter” tool because it easily imports and exports many different file types, Grasshopper works inside Rhino itself. Grasshopper produces geometries by assigning different objects already modeled in Rhino to different parameters that change the objects’ values or characteristics. The interface is similar to that of a flow chart or circuit with different aspects of the modeled geometries “flowing” through different parameters. The resulting forms can then be “baked” or permanently modeled in the Rhino window to continue the design process. Available within Grasshopper is the add-on called Kangaroo, which we also chose to research and familiarize ourselves with. Kangaroo is a live physics engine for Grasshopper and thus Rhino as well. It produces soft, natural geometries created by simulated forces acting upon meshes, planes, points, lines, etc. For example, we could assign a mesh to be held up by the four corner anchor points and allow a simulated force similar to gravity sag the geometry and create a tensile structure when manipulated. Also available for Grasshopper, is the add-on called Weaverbird, which is essentially a powerful panelization tool. It can take organic, free form, mesh geometries baked into Rhino and create panels, which can ultimately be very easily flattened and fabricated for a seamless and feasible design. This tool is what caught my eye during research because of the effortless computing that is done so easily for you. Most of our studio is working on creating very dramatic and difficult skins for their building projects so this tool can immensely aid them in fabricating such geometries. These programs, although proven to be very beneficial in the production of our studio designs can be costly. Luckily enough though, most of the larger programs come in a free student version and most, if not all the additional plug-ins and add-ons are free. 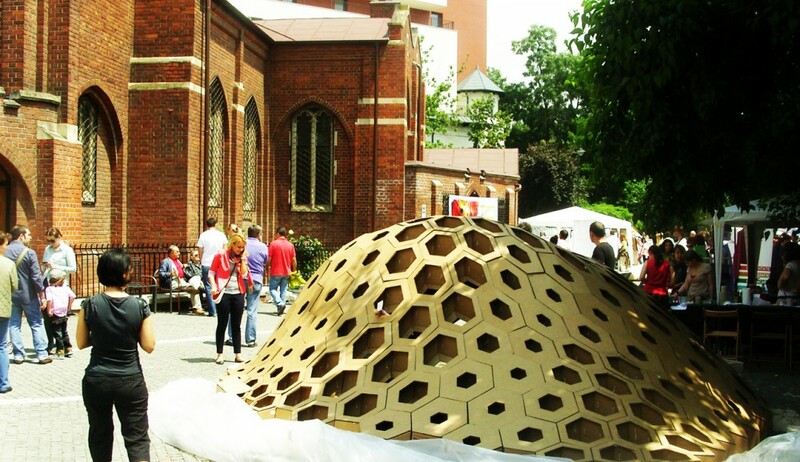 Entitled “Hexigloo,” this parametrically designed pavilion was installed in a public space in Bucharest, Romania as the result of a weeklong workshop with students and professionals. The design of this interactive space was based on the pattern of a honeycomb, utilizing the intriguing hexagonal pattern. It was made entirely out of laser cut 6mm cardboard and installed in about 80 hours. 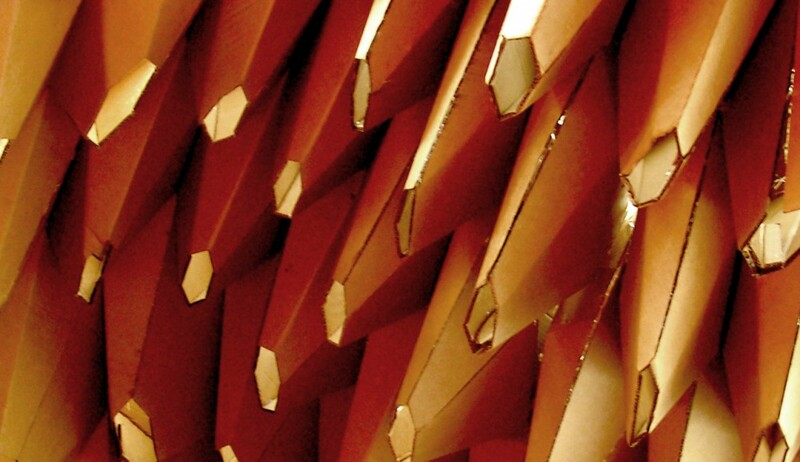 The interior of the space is drastically different than that of the exterior, which is comprised of “cone-like funnels” to allow light in the space from the hexagonal apertures. The interactional aspect of this piece is most interesting to me, because it was designed in order to be inhabited. It’s intent was to be played with and not just seen. Also, this project was intended to introduce parametric design and the software used to model such things to the large group of students who worked on it, so perhaps something of this sort could be possible in the Niehoff Studio? Allowing the public to feel, experience, and inhabit the fruits of education is quite inspiring, yes?